Having good lighting is essential in maintaining good eyesight. If there isn’t adequate lighting it may affect your eyesight in the long run. Nowadays there are so many different study lamps available in the market. How does one make a choice then? What are the criteria that is involved in choosing the most suitable lamp for the home? The kids and I are blessed to have near perfect eyesight and we do not need to wear glasses. I have been teaching them good eye care habits and ensure that they do not strain their eyes and spoil their eyesight in the process. They are given regular study breaks and have study tables and chair which are suitable for their growing bodies. Being in primary school the boys have quite a bit of homework to complete on a daily basis. Sometimes if they are not able to complete the given assignments before dinner they would have to finish up before going to bed. The first step that I took to helping them maintain their perfect vision was to get them a good study lamp. This year we were fortunate to receive a 3M LED 5000 Polarizing Task Light for the boys to use. They were really excited to receive their own study lamp after they have witness how cool the 3M study lamps are when we got the 3M LED6000 last year. The boys had been eyeing that lamp which I had been using for my own study table. They have seen how easy it was to do reading and desk work with an anti-glare lamp which has adjustable levels of brightness and couldn’t wait to try out their own. The 3M LED5000 Polarizing Task Light has a really sleek design and takes up minimal space on the desk. It doesn’t heat up even after hours of use and is safe for kids to use. The height level is just nice for the boys and being anti-glare it makes it easy for them to focus on their homework/ reading. It really jazzed up their study area. 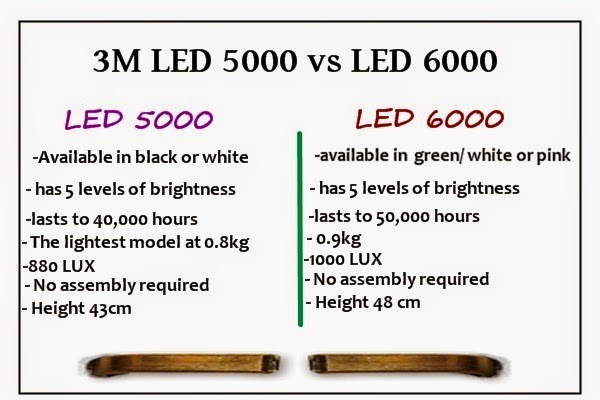 If you are wondering how the 3M LED5000 stack up against the previous 3M LED6000 model here is an info graphic which I have created. The 3M LED 5000 Polarizing Task Light is lighter, shorter and more compact as compared to the older model. The Luminescence level is relatively the same however there is a 10,000 difference in the number of hours the LED light is expected to last. The main drawback that I have found in the LED5000 Polarizing Task Light is that the lamp it is not as extendable as compared to the LED6000 Polarizing Lamp. It has to be placed nearer to the person using and it covers a smaller area. The lamp is more suitable for small or narrow study tables. The LED 6000 would be a better choice if you have a wide computer table with a lot of space and need the lamp to cover a large area like I do at my study area. You are also able to bend it to different heights depending on what you need to be illuminated. Both these models are excellent choices for study room lamps and I certainly recommend them. If you are interested in purchasing the 3M LED5000 Polarizing Task Light you can get it for $239 (with GST) from Best Denki, Popular Bookstores and other leading retailers. 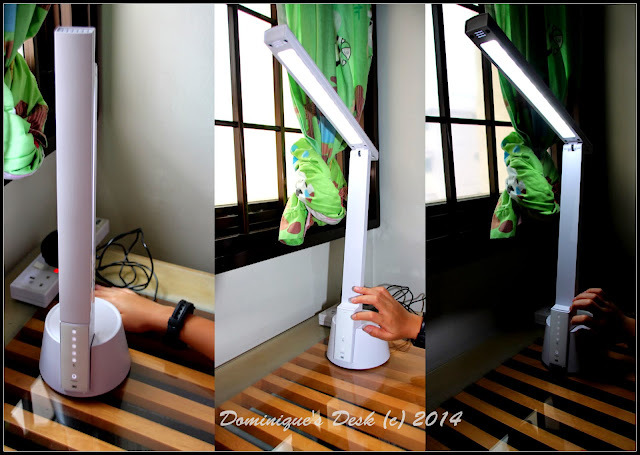 Disclaimer: I received a White 3M LED5000 Polarizing Task Light for review purposes. All opinions are 100% mine.